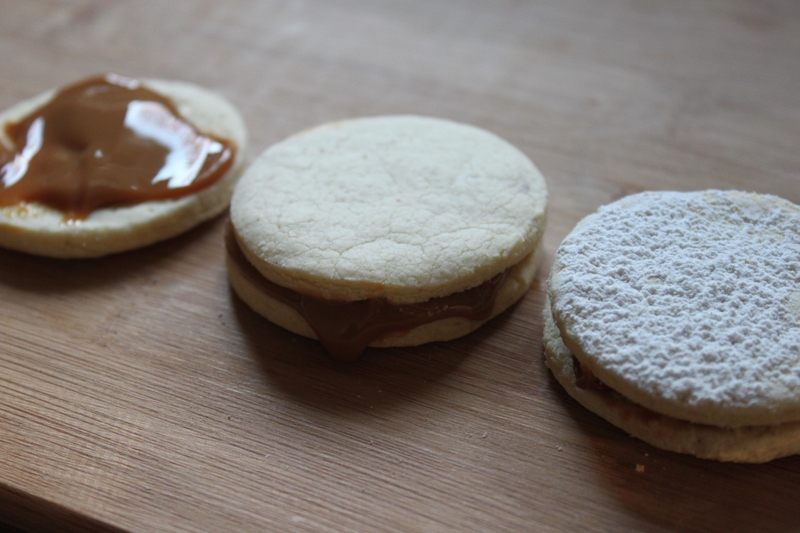 Don’t cry for me Argentina, not when I have Alfajores. When dear friends of mine go on wonderfully romantic and international vacations, I find solace in food. I know, shocking. But instead of sitting with a pint of Ben and Jerry’s in my sweat pants when my friend Robert went on his Mediterranean sojourn with his love Jeff, I baked the classic Italian tri-color cookies. Viva Italia! Oh yes, and viva almond paste! Now, two of my favorite people, Craig and Jack, were going to be vacationing in Argentina. Now, again, I could have opted to wallow in my own little pity party. But no, I learned from Robert’s trip. I was not going to wallow in the fact that I would, in fact, be spending the majority of the same time in an office park in McLean, Virginia. I was going to use this opportunity to grow. Sure, it resulted in my growing wider, but growth is growth and I will take it. So while Craig and Jack galavanted about the Pampas I googled. And as a result of my googling I learned something very, very important. 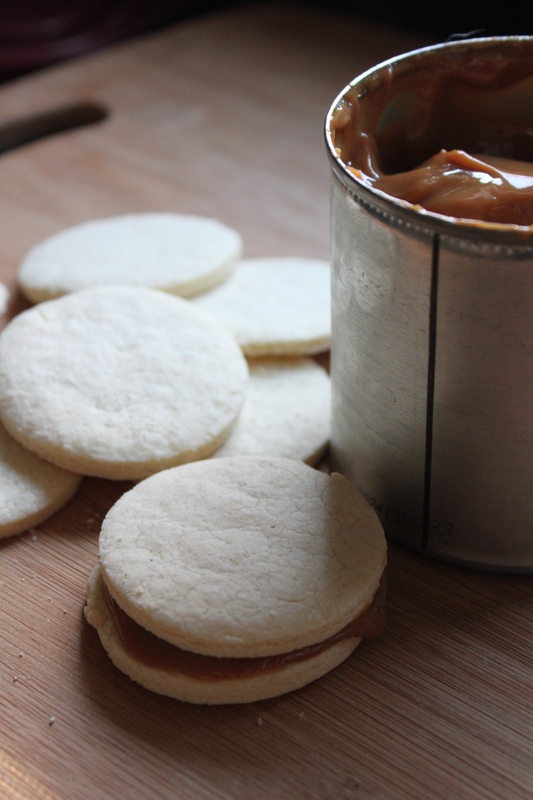 Did you know that Argentina is the land of Dulce de leche!!! Yeah, they invented it. At least according to Argentina. I think Uruguay has some issues with this proclamation but I am not going to go into that, because that would distract me from what is most important. That most important thing being, finding tasty recipes to make that use dulce de leche. Turns out, there are a lot. So, while Craig and Jack were embracing their inner gauchos, I embraced alfajores, a traditional Argentinian cookie. I came across an interesting recipe at gourmadeathome.com. The cookies are made with a substantial amount of corn starch, and I think it was the corn starch that made them so flaky and light. And when Craig and Jack, having just come back from Argentina, approved of my alfajores, I glowed. So I can pretty much promise you, these cookies are going to be a big hit. Sift together cornstarch, flour, baking powder, salt and nutmeg. Set aside. On low (or by hand) mix butter, sugars and vanilla until light and fluffy. Add the egg yolks, one at a time, and mix until incorporated. On low, add the sifted ingredients. Roll out the dough to about ¼ inch thickness and cut out circles (traditional) or have fun! I have an apple cookie cutter shape I want to use to create another variation on caramel apples. But for my first try, I opted for the traditional circular route. Place cookies on to parchment paper and place on baking sheets. Bake for about 10-15 minutes. 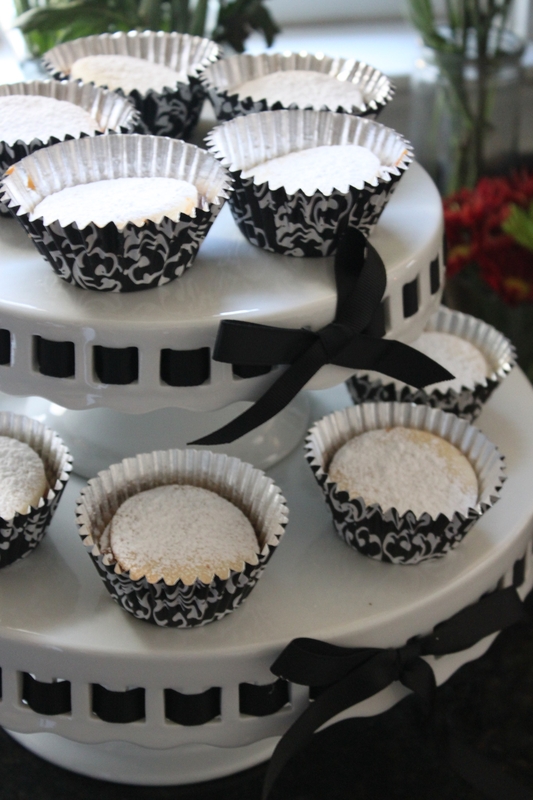 Because I am using powdered sugar and I am, well, me, I like the idea of placing each cookie in a muffin cup. Keeps the powdered sugar contained and off my clothing, and that, is a good thing. When the cookies have cooled, add dulce de leche and a little powdered sugar and be prepared to slide blissfully into a full on sugar coma. Ole! Gift pantry score: A doggone good deal! The scoop: A list of sites and ideas I love that keep me from doing what I should be doing. Yum! I’ve never heard of these, but they look delicious! A few people at work told me they were the best baked good I have ever brought in. The went over big.